In the church I grew up in we thought of ourselves as restoring the New Testament Church. This was a way of saying that the way we did things was intended to be a copy in all things essential of the church as we see it in the New Testament. We fought one another over the minutiae of this project, like whether the early church had one or many communion cups, but we never seemed to bother too much over whether they had things like air conditioning or a/v systems. The idea that there is some pristine point in the past, such as the Apostolic community, which we can unearth and restore in our present age is called primitivism. Its easy to see how in many ways this is a naive sort of effort. But before we all ride off into the sunset on our high-horses it should be noted that every Protestant tradition has some element of primitivism in their theological make-up. Ideal early state + Historical corruption = Lets get things back to the way they were. This book is important for us, then, because many of us hold on to these kinds of beliefs without either recognizing them or examining them. Hughes and Allen call these primitivist ideals into question, without at the same time dismissing them altogether. There may indeed be value in idealizing an early age, but there are also potential dangers to naïve assessments of that history or of the viability of straightforward re-presentation of such a past age in our modern world. The central point of this study is that the “ahistorical” tendency of Christians to think of themselves as a direct copy of some far-away point in history is not only naïve, it is destructive, because it blinds us from our own faults and contingencies and fosters sectarianism—the assumption that only “our” group has it right and everyone else is therefore wrong. If we learn and appreciate our history we can gain a deeper understanding about where we can and do intersect with the ideal past and where we can’t and don’t. 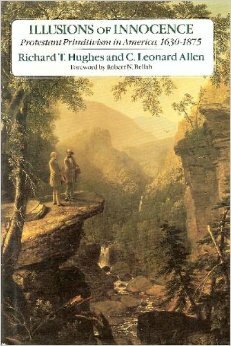 In their broader analyses, Hughes and Allen focus on the ways in which primitivism flourished in the early experience of North America (more specifically the United States). America understood its own identity in terms of a primitivist lens, though one that mythologized a kind of primordial “nature” rather than religion. America provided people with an opportunity to gain a fresh break from the weathered histories and trappings of Western European history. The sense of newness and destiny in early American idealism were model grounds for cultivating primitivist interpretations of Christianity—as such the groups that grew and flourished the most rapidly also had strong primitivist self-understandings: Baptists, Disciples, even Mormons. Hughes and Allen devote most of their historical inquiry to these groups. In their introductory and concluding sections Hughes and Allen offer something of an analysis, diagnosis, and prescription for the problem of uncritical primitivism. As mentioned above, such an outlook not only cripples our own growth, but it fosters divisiveness and antagonism among social groups. By way of a sociological point of view Hughes and Allen effectively bring to light the true nature of primitivism as a point of view that is deeply rooted in and indebted to the history it critiques and tries to escape. At the end Hughes and Allen advocate for a more learned, sober understanding of our pasts not to the point that we lose sight of it altogether, but that we appreciate both ourselves and our pasts in a deeper and truer way. In this context [see above quote], and in the face of a bewildering array of Christian denominations, sectarians found that the appeal to pure beginnings was the surest way to cut through the confusion of religious pluralism. To proclaim one’s own sect a reproduction of the ancient, apostolic order was to anoint one’s sect the one, true church while all others were merely historic, tradition laden, and therefore false. (21-22). What makes this book great is the vitality with which Hughes and Allen engage in the subject. Here are two scholars at the beginnings of their academic careers whose writing conveys a sense of interest and excitement, a sense that these issues matter. I think this kind of motivation makes their criticism more well-rounded. They’re not interested in tearing apart some obnoxious idea, they’re interested in engaging it, tracking how it functions historically, sociologically, and theologically, and seeing how we might better approach the topic based on a deeper understanding of the issues. Anyone interested in this phenomenon that, to one degree or another, describes almost every Protestant should read this book. For some it might be a little disappointing, but my experience of studying history with others is that it is liberating. It puts things into perspective, explains in new light things we’ve always done and thought without knowing quite why. And studying history ultimately frees us to work out our core values in truer and more authentic ways. I really enjoyed this article. I’ve spent some time reflecting on primitivist tendencies myself, both in relation to Christianity and in a broader sense – for example with the mythological Greek golden age. Humans seem to have a tendency to create idealistic dreams of return for themselves and in theology it’s easy to see how this could be very alluring. After all, proximity to God was presumably greatest, in the narrow sense of the term greatest, at the moment of creation. But of course this kind of thinking tends to ignore the fact that all progress and history would be superfluous then since if perfection was already achieved in some satisfied state in the past then there would be no need for anything to happen after that point. Anyways, I very much appreciated your review of the book and I look forward to following your posts in the future. Reading a good summary of a book is a pleasure and an edification in itself – regardless of whether the whole work is read later or not. I’m glad you enjoyed the review, and happy to hear it was edifying on top of informative! I aim for that kind of thing, but I never know if I hit the mark.